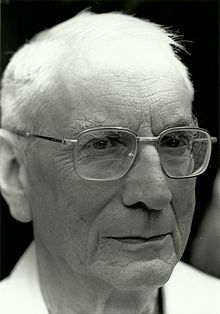 The other day I was going over my notes while reading Donal Robertson’s Stoicism and the Art of Happiness, as well as Pierre Hadot’s (see photo) The Inner Citadel (his meditation on the Meditations), and have decided to produce a summary concept map of the three disciplines of Stoicism: Desire, Action, and Assent (see graphic below). Hadot (and Robertson) suggest that each discipline is connected to one of the three pillars of Stoic philosophy, respectively Physics, Ethics and Logic. They are also linked to the four Stoic virtues: Courage and Temperance (regarding Stoic Acceptance), Justice (regarding Stoic Philanthropy), and Wisdom (regarding Stoic Mindfulness). I added three quotes, from Epictetus and Marcus, which I think reflect the three disciplines, though of course several other equally apt citations could be substituted instead. In fact, if people have suggestions, please post them here. 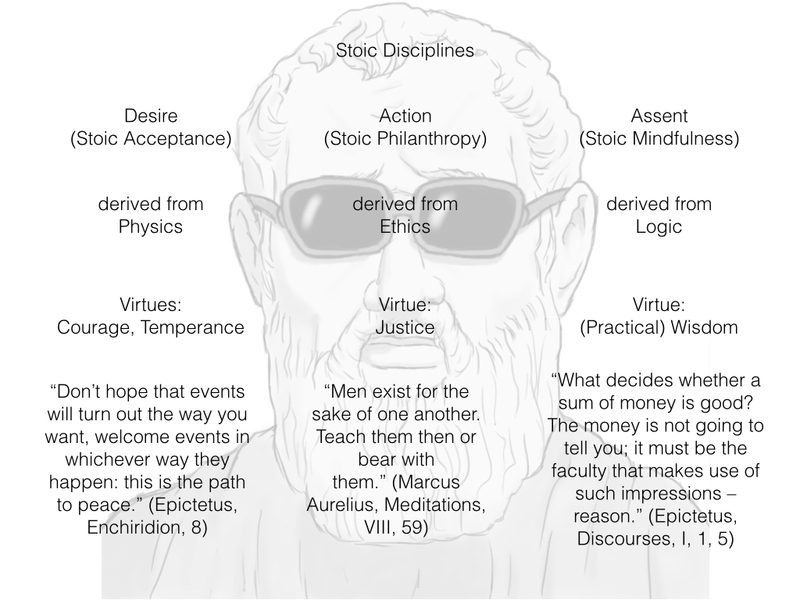 At any rate, I hope the graphic is going to be a handy reminder of the connections among some of the most fundamental Stoic principles. This entry was posted in Ancient Stoicism on March 27, 2015 by Massimo. This is very helpful Massimo. From, in part, reading your article here: https://scientiasalon.wordpress.com/2014/11/17/the-stoic-egg/ And also from my recent re-reading of Epictetus, I agree Physics (or Nature (or God)) is the heart of the Stoic egg in your ScientaSalon article. a.) Logic–Our nature is to be spectators in the contemplation and understanding of Nature particularly in that aspect of Nature which is ourselves. c.) Death — vigilant awareness and acceptance of death is bound up with celebrating life–which results in Courage and Temperance. I was going to provide sample quotes from the Discourses which I think back this view up very much… but it ended up being just too much text. Massimo, this chart is very clear and I especially appreciate the quotes you chose. 1. It very much (to me) seems that Justice belongs under the Action discipline. Doesn’t “Courage” belong under Action as well? For how would it be to have courage without action? 2. Is “Justice” the application of an ethical standpoint? In a way, I can’t help but think about “Justice” without some ethical code. Is that just my modern mind, or is it implied in what the Stoics intended? Thank you for your continued searching and sharing with your Stoic students. Vienna, I too, am looking forward to Massimo’s further thoughts on your questions. Maybe they will be in his book. Massimo, aren’t you writing a book on Stoicism? For now, if I may share my own views on your questions. Interest in this blog has caused me to start reading Epictetus again and a few passages came to mind when reading your questions. “Welcome events whichever way they happen”. I think Stoic courage cannot be summed up better than this. Death is the Big Event of course, and if we can accept that, what else could possibly cower us? This, of course, is a God passage; Nature is the Giver. Maybe there are benefits in personification of Nature that atheists cannot access, but I tend to think not. After all doesn’t Nature take the form of many persons in those around us that we love? So even if Nature is not one person, it is certainly personal. We have plenty of opportunity to adore and be grateful to Nature/God in them even as Nature takes away the life it has given. The Lord gives and the Lord takes away, praise be to the Lord! This is Stoic acceptance and courage. This is what I love about Love; it is so amazing and beautiful in it’s simplicity; anyone can to do good, co-operate with others, and wish them well. Wm., well, it’s more accurate to say that I’m working toward beginning to write a book… Putting together a proposal and sample chapter with my agent. I have to finish another project with Chicago Press this summer before I can get started on the Stoic one, so it will probably be Fall ’15 before I get going. Hi Wm, thanks for your comments. First, I still do have a lot to learn about Stoicism, but for now I reply that there is a difference between Stoic “Acceptance” and “Courage” in what I have been reading. Maybe it is a translation problem that these two terms get used in different ways? I think one of the modern misconceptions about Stoicism is that Stoics have a way of accepting and acquiescing to the world, when on the contrary, I see Stoicism as a way to empower people to build the virtue of Courage in order to ACT when it is possible to do so. Not to acquiesce, but to have the judgment and then make a move when the moment is ripe for the moving. Second, I still have trouble seeing a personal objectification (or metaphorical personification) of “Nature” as the Giver in Stoic thought. However, Massimo’s writing here and elsewhere about Logos has been more helpful than the Irvine/Robertson books. Massimo also speaks about “The Singular Universe and the Reality of Time” by Unger and Smolin (https://www.youtube.com/watch?v=1ZzGENkS-b0 around the 26 min. mark), in which the authors write that Time is fundamental, that there is one universe, and that Causality is the principle from which laws of nature follow. This is the closest thing I can come to understanding Stoic Logos (or even Zeus). So my question to Massimo (I can hear him thinking…) is whether the Stoics had in mind the first part, but not the second part, of the definition of Justice? And if that is the case, how can Justice be under the category of Action? vienna, [thinking, thinking] I think you are right that the Stoics would agree with the first part of the Oxford definition of justice (The quality of being fair and reasonable) but not the second one (The administration of the law or authority in maintaining this), but I don’t see why this would represent a problem for justice being under the category of action. The Stoics clearly meant personal action, not the action of an overseeing state. Or am I missing something? Hi Vienna, I agree regarding your thoughts on courage and acceptance. Well said; it reminded me of the Serenity Prayer. I would add that, in my view, Epictetus gave precedence to the ‘grace to accept’ what we can’t change in that both the courage to act and the wisdom to know the difference are grounded in this grace/serenity. For example; it’s easy to imagine someone who is ‘courageous’ in that they desperately act without regard to risks because they are unable to accept what they can’t change; it’s hard to imagine someone who gracefully accepts hardship and death who does not have courage to change what they can. Regarding nature, It seems to me that the idea that time and causality are fundamental is very much in tune with the Stoics. This implies that the universe unfolds deterministically according to either initial conditions or eternal conditions. Either way, as Marcus Aurelius says, “the implication of causes was from eternity spinning the thread of thy being”. I think it very difficult to be a Stoic and think humanity is an insignificant fluke of nature. This doesn’t mean that nature has one personal unified consciousness which is directing it, but it does mean that the personal, or love, we meet in other humans is essential to what the universe is. It means that when someone loves me, that expression was latent in the universe for it’s entire existence and when I am grateful I am grateful to all the ‘eternal implications’ that made that person who they are. Epictetus says that “Nature ends in Man” and that end is to not only “spectate, but to interpret Nature”. That is, humanity is the central hermeneutic for interpreting nature, and I think understanding this may be essential to being a Stoic. Under this understanding, humans are divine if nothing else is, and we can express our personal gratitude, devotion, and love to the divine nature in the persons of those around us. I don’t mean any of this metaphorically. Rather, for me, gods are metaphors for the divinity in humanity. Back to justice. I’m skeptical that a Stoic would see justice in forcing others to do good or cooperate, whether by laws or otherwise. They may see a good reason to pass laws forcing behavior, in some cases, simply to make society more functional, but for a stoic, justice is something individuals do, not something they force others to do under threat of imprisonment or penalty. I guess the heart of my question about Justice is really about taking Action in the world–in the sense that a Stoic would take action to prevent “Injustice” in the world. I’m not concerned with the Justice of an individual’s personal choices toward others, really more in finding a way to explain things like fighting wars and carrying out punishment if/when injustice has been perpetrated in society. I view the idea of Stoics as being inactive participants in the world in complete contradiction to the lives that we know real Stoics lead in history, so I’m wondering if they had some sort of social ethical code in carrying out “Justice” as a virtue–beyond their own personal actions in being good, cooperative, well-wishing, (passive recipients of the world’s actions outside of their control), etc. And besides the fact that many of the Stoics were in fact statesmen, implies that there was some “administration of the law or authority” taking place, no? yes, the Stoics were not passive, and as you say some even engaged in statesmanship and waged wars. But I still don’t think they kept to a specific set of rules, if that’s what you mean by “code.” Virtue ethics is about character, unlike say deontology or utilitarianism, which are about rules. So a Stoic would say that each circumstance is to be judged on its own merit, and the person of character (wise, courageous, etc.) will determine what to do on a case by case basis. Aha, yes, that makes more sense to me. Thank you for your distinction of rules vs. character. One more thing I would like to add: Since practicing Stoicism, I find that I feel more empowered to take actions in my life. I am convinced that Stoicism is a way to clarify the opportunities in which each of us has control over elements in our lives and encourage (hence, “Courage”) us to take action rather than not. This is why I am interested in the Stoics’ choice of Justice as a prime virtue (which implies right and wrong) and Courage as an Action (active instead of passive). Thanks for the discussion! I have just read your post about your recent conference talk on death and it reminded me of a question on the disciplines. What is the source of Stoic motivation? In other words, if Desire means training oneself to embrace events as they come as opposed to hoping for a particular outcome, where do we find the drive to do more and be more? I have heard you speak about this briefly, countering the idea that Stoics do without motivation, but I don’t recall where that motivation does come from. I could see an argument from motivation in the area of Justice – if we see injustice, part of being a virtuous person means working to correct that injustice – but what about in personal life? There is no particular value difference between different life paths (career choice, marriage, etc) and yet we often have this desire to do more or be more – or simply to be something other than we are. That desire drives us to greater things. One might try to argue that the Stoic position says, “Don’t worry about all that, just find contentment with your life as it is.” You have countered that notion, but I’m curious about the other part: if Stoicism does not mean accepting life as it is as opposed to striving to pursue a desire to be or do something different with life, then how does Stoicism encourage people to pursue desire of this kind – or, put differently, where does Stoicism find the motivation to pursue personal desire on matters that do not appear to deal directly with virtue? Actually, that’s much closer to the Epicurean than the Stoic position. As you note, Stoics were very socially engaged, so there doesn’t seem to be an issue about the motivation to try to make the world a more just place. In terms of personal motivation, the Stoics do treat things like marriages (or relationships in general) and careers as “indifferents,” but also point out that these are “preferred” indifferents. I.e., it is perfectly natural to have a drive to marry, find a good career, and so forth. And as long as one: a) is conscious that those things are outside of one’s complete control (so one could fail); and b) doesn’t think that they are substitutes for the pursuit of virtue, then Stoics doctrines are compatible with such pursuits. That does help, and helps to clarify something else in my thinking. In a world full of injustice, I have wondered how those caught in the middle of injustice can find meaning. I have imagined that for myself: what if I were the person who lost family and possessions in Syria and was stuck with nothing in the middle of a war zone, etc. The religious answer is to point to an afterlife and, in certain forms of Christianity, to claim that the sufferer deserves suffering anyway so there is no cosmic injustice. This position is obviously problematic. But if I understand you right, the Stoic position would be that while the sufferer’s situation is not preferred, it does not undermine individual ability to strive for virtue and, through virtue, to make a meaningful (eudaimonic?) life. I’m not sure how well this plays out “on the streets”. I’m not sure that many people would be able to say, “You know, I’m caught in [slavery, war, poverty, sickness, whatever], but I am constantly striving to be a better person, and I find my satisfaction in that striving.” Perhaps one aspect of virtue is the simple ability to find eudaimonia irrespective of preferred circumstances? That raises another question – probably best fits your post on the different forms of eudaimonia from a few days ago, so I’ll slip the question onto that post. Chris, I think you got it exactly right. As for the person in the street, well, Stoicism was pretty popular with regular folks in ancient Rome and Greece. And of course, de facto, a lot of religious people the world over are adopting a similar attitude, except for the fact that they expect to be rewarded for it in the afterlife, while Stoics saw the pursuit of virtue rewarding in its own regard. An important metaphysical distinction, but hardly one that makes things very different on the ground.